Artists have long been addicted to beauty. For many, if not most, painters as they choose a subject, beauty may well be the first and foremost consideration. There have long been exceptions, of course--Gericault's Raft of the Medusa comes to mind. Gericault, though, was a history painter, one of many who have explored the darker (dare we say ugly) side of human existence. Ugly is not a common theme in art, especially as applies to portrait artists (not intentionally, at least). If the truth be told, most artist tend to err on the side of flattering their subjects, human or otherwise, adding a touch of beauty here and there at the expense of verisimilitude. The tendency helps sell the art and feed the wife and kids. Mary is a homeless girl living on the streets of New York. 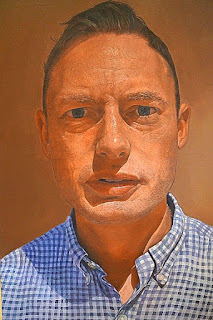 By traditional standards, the British painter, James Earley, deliberately paints ugliness. Notice, I didn't say ugly paintings. 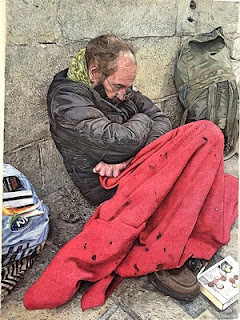 Ugliness, like beauty is in the eye of the beholder, and despite his often unpleasant subject matter, as in his Jesus Christ (top) there is also a strangely touching beauty inherent in many of the images of homeless street people he produces. Mary (above) strikes many emotions in seeing it. 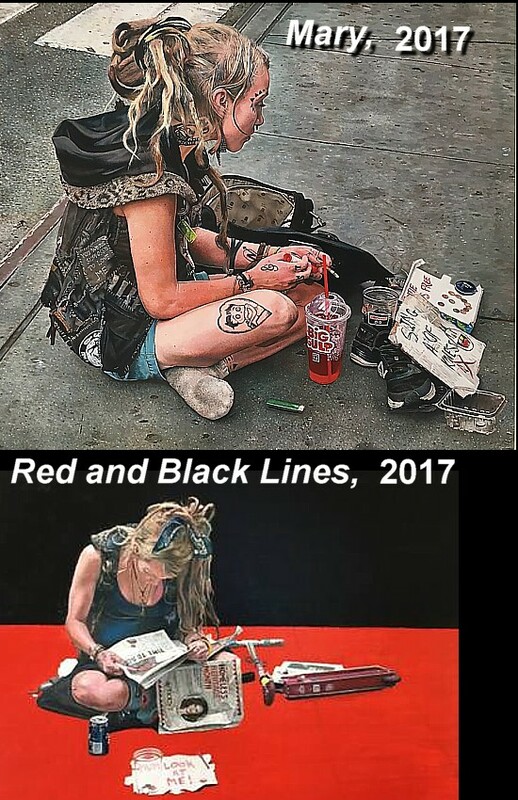 The artist added only two things to the painting, the first being a slogan on the back of her jacket which reads “You were supposed to Love Me.” The second is a barely visible jug on the floor that is labelled “Anointing”. This nearly “invisible” jug gives the painting a completely different meaning as a modern parallel to Mary Magdalene and the anointing of Jesus Christ. James Earley is a British contemporary painter currently living in France. He is renowned for his emotional portraiture, in which he depicts individuals who have been through trauma and exist on a emotional knife edge. Earley favors oil paints for their flexibility, allowing him to mix his paints on the canvas rather than on a palette. 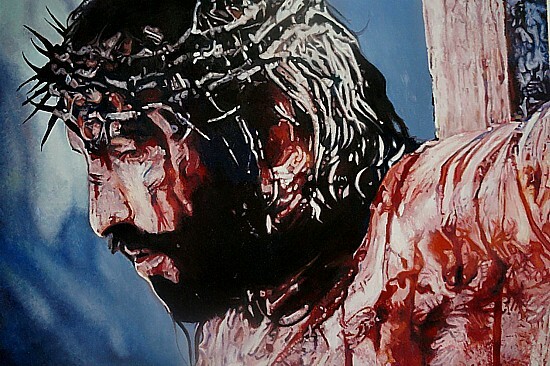 While his style is principally realistic, he adds many elements to create the desired emotional response in the viewer. He does not focus on art as an aesthetic object, but instead sees art as a way to express his personal emotions. The painting, Shadows (above) demonstrates the fragility and danger of the situation--a man sleeping, peaceful yet only inches away from a busy road. Earley accentuates the contradiction with the litter bin, which seems to suggest the man as litter. In many ways the homeless are seen as untidy litter. These contradictions spin around the painting yet come together in the shadows Earley has exaggerated with a deep purple. Shadows are the contrast, the contradiction to our physical form, the problem that prevents a cure to be found on the homeless issue. It is only when we see the homeless as people and not shadows that we can take the first steps in helping them. 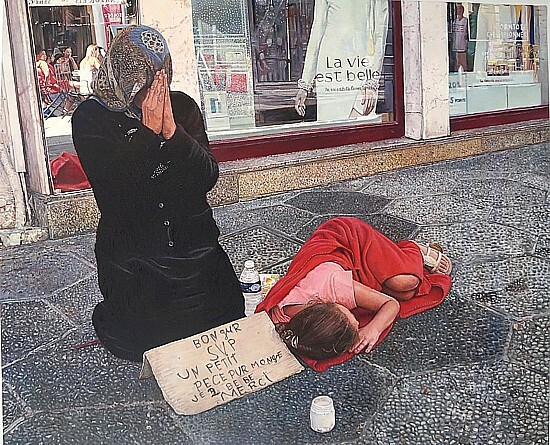 La Vie est Belle (above) is an oil painting of a homeless mother and daughter on the streets of Nice, France. The title translates to English as Life Is Beautiful. The artist met them in 2016 just days after a terrorist attack. The atmosphere was volatile and seemed to come to a crescendo at meeting these two people. I particularly wanted to paint this due to all the contradictions, the mother and daughter begging against a back ground of expensive clothes shops with slogans such as “life is beautiful”. The mother's sign, as nearly as I can translate the broken French reads: "Good day Please, a small pece pure monye I 2, be thank you." Born in 1972, Earley began as a traditional portrait artist. However, in 2015 the work of James Earley took a radical turn with his powerful, emotional studies of homeless people, victims of war, and religious martyrs. This work took him to another level in the art world as he was nominated by The BP award, The Royal Institute of Oil Painters and The Royal Institute Of Portrait Painters culminating in his work being displayed at the iconic Mall Gallery in the heart of London. Since then, James Earley has emerged as one of the foremost pioneers of figurative painting in Britain today, a fact all the more remarkable since he is a self-taught artist. He has had an affinity for the homeless since childhood. Earley has often been urged by others to change his subject matter, producing paintings that would look nice on someone's wall. He counters such advice by insisting that when someone purchases one of his paintings, they are purchasing a bit of the artist as well, the canvas simply being an emotional battleground. Earley first met the homeless man (right) in Toulouse, France, in 2014. You can see the artist's reflection on the window of the painting as he was taking one of several photos. There is sadness in his eyes, coupled with a certain noble dignity marked by his tiny tattoos and the stark contrast of the brickwork. Much the same effect can be seen in He Is Silent Now (below), of Aaron, a homeless man living on the streets of London. 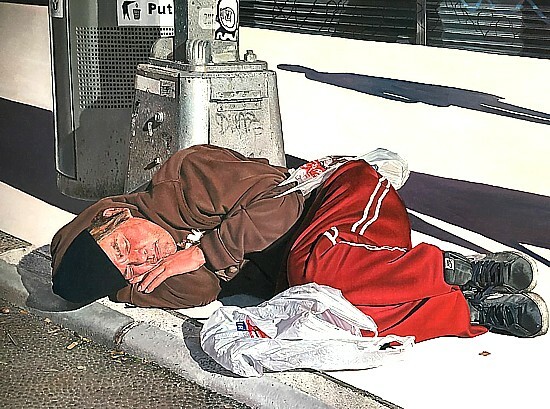 Earley's work makes us painfully aware that homelessness is not limited by gender, by age, nation-ality, mental condition, or any other of the common stereotypes we tend to invent. Sadly, it seems to be universal. 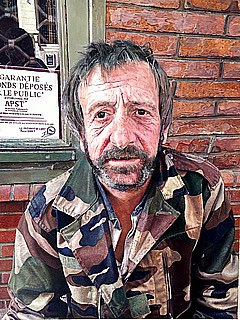 Toulouse Homeless Man, 2015, James Earley. 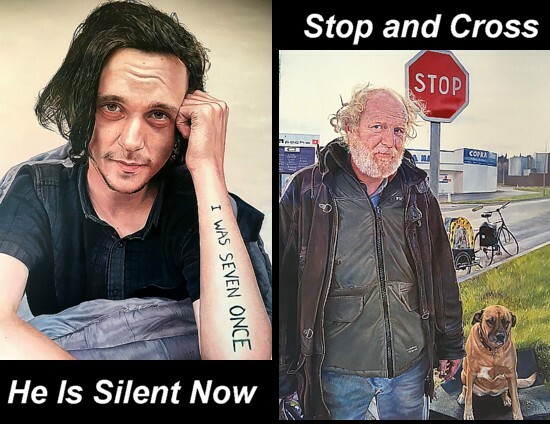 Stop and Cross (2017) is of a homeless man in Limoux, in the south of France. The man and his best friend, his dog, seem to have the same expression, of despair and fear, yet there is a feeling that together they are strong and they have not given up. The artist added a reference to the disciple Matthew who described in the Bible his views on homelessness. The chapter and verse reference can be seen embroidered in the coat of the homeless man. He also added a crucifix which can be seen on the mat where the dog sits.